Syntax highlighting with just one click! Selection menu for syntax highlighting, publishing period, etc. Say your classmate asks you for help with a programming task that you’ve already done, or you find a cry for help on a forum for a required source code snippet that you would like to share. All you need to do isquickly copy your source code and publish it via click.to Pastebin.com. It’s even possible to publish it with lots of highlighted syntax – the preferences are all ready to use in click.to! 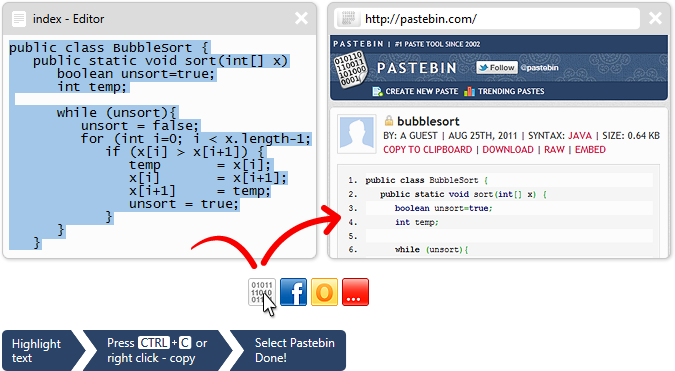 With CTRL + C, plus one click.to Pastebin.com, you save the time it takes to open your web browser, type the web address and log into your account. With one click, your source code becomes available online via a URL that can be quickly and easily shared with your classmates or forum. Simple, fast and convenient.